Interested in participating? Click here for information and an application form. Application deadline: 9:00 a.m. Wednesday, March 13th, 2013. Submit your completed application, via e-mail, to Lidia Nonn at nonnl@uwgb.edu. Selected applicants will be contacted by the PITR Coordinator. 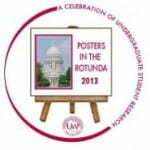 In addition, selected applicants will need to submit a completed poster by March 25th, 2013. Please Click Here for Posters in the Rotunda Application Form. A faculty mentor is required: Each presentation should be sponsored or co-sponsored by a UWGB faculty mentor(s); non-sponsored abstracts will not be accepted. Poster specifics: If chosen to present, the PITR Coordinator will be in contact with you. Presenters will need to construct a self-supporting poster to be placed on an easel for viewing. Students will receive one-on-one assistance in creating their poster or adapting it for the session in Madison. Presenters will receive assistance with poster printing costs and easels will be provided. Eligible work: An eligible presentation will report, perform, or represent the outcome of substantial work by a student or group of students. While the project may have its origin in an assignment for a class, the presentation should show it has been developed above and beyond a class requirement. It is a paper, artifact, or performance that can truly be called a creative achievement. Faculty mentor is required: Each presentation should be sponsored or co-sponsored by a UWGB faculty mentor(s); non-sponsored abstracts will not be accepted. Travel: Travel to Madison will be provided. If you are interested in participating but aren’t sure, contact the Office of Grants & Research, we will be happy to talk you through your research, poster, or the event with you! Presenting at the Posters in the Rotunda (PITR) symposium is an excellent way to share what you know or what you’ve learned in your field of research. It’s also a great way to meet new people from the other UW campuses. So don’t wait – participate!